Bank fixed deposits (FDs) continue to be popular investment products not just among senior citizens, who are looking for guaranteed income, but also among investors who can’t stomach risk. But over-exposure to FDs is not good, and you need to assess your asset allocation and goals to decide how much money you should park in them. For instance, saving for your child’s higher education that’s 15 years away through FDs may not be effective as the post-tax interest rate of an FD may not give you a real return (return that’s above the rate of inflation), but if you plan to take a holiday in two years, an FD can help. 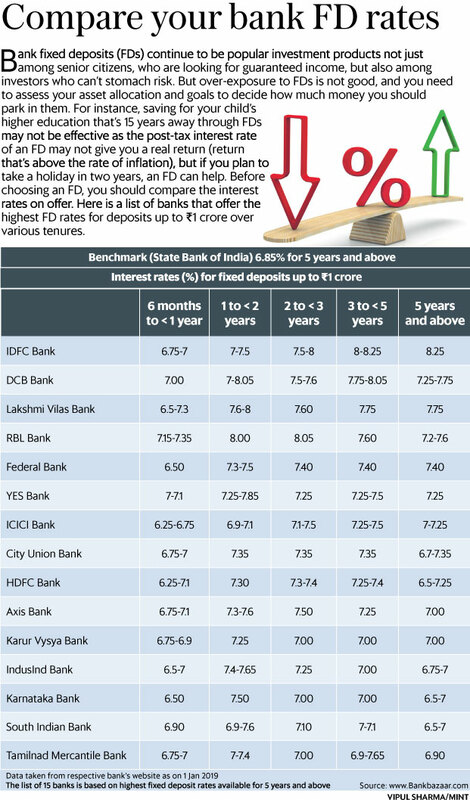 Before choosing an FD, you should compare the interest rates on offer. Here is a list of banks that offer the highest FD rates for deposits up to ₹1 crore over various tenures.